With ongoing climate change, many climatologists predict that the American Southwest is in for an extended drought. Currently in Huntington Beach, CA where I live, we are under mandatory water restrictions for the first time in the 30 years that we’ve lived here. Times are indeed changing. This Suncast rain barrel has a large footprint. Water runs off the eaves and directly into the barrel, which has a screen top. Features are a spigot with short hose, overflow hose, and removeable top. We got this non-traditionally shaped barrel at OSH Hardware for a promotional price of $89. First, some basic facts and figures. Huntington Beach receives an average of only 15 inches of rain a year, which is a near-desert condition. Grassy lawns and many flowering annuals require a whopping 52 inches of rain a year. Our town has a population of about 200,000, and is located in the greater Los Angeles area, which has a population of about 14 million. Needless to say, the amount of rain we get isn’t enough to meet our needs. We rely on imported water from the Rocky Mountains and Sierra Mountains, but global warming is reducing the amount of water that these areas can provide. Something has to change. We have drought-tolerant landscaping in our yard–no grass! But my fruit trees and vegetables like more water than our California native plants. Still, we use less than 100 gallons of water a day, and that was before the use of our rain barrels. The average California family uses 171 gallons. To assist in our water conservation efforts at home, we have recently installed a series of rain barrels of various types. Right now we have a storage capacity of 280 gallons, with plans to add another 100 gallons of storage. 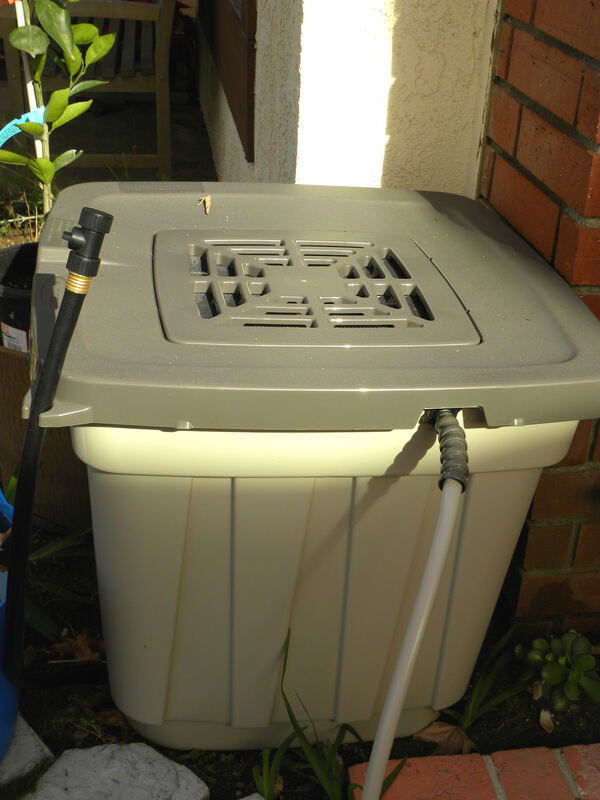 The simplest form of water storage is simple trash barrels or other containers set under dripping eaves. 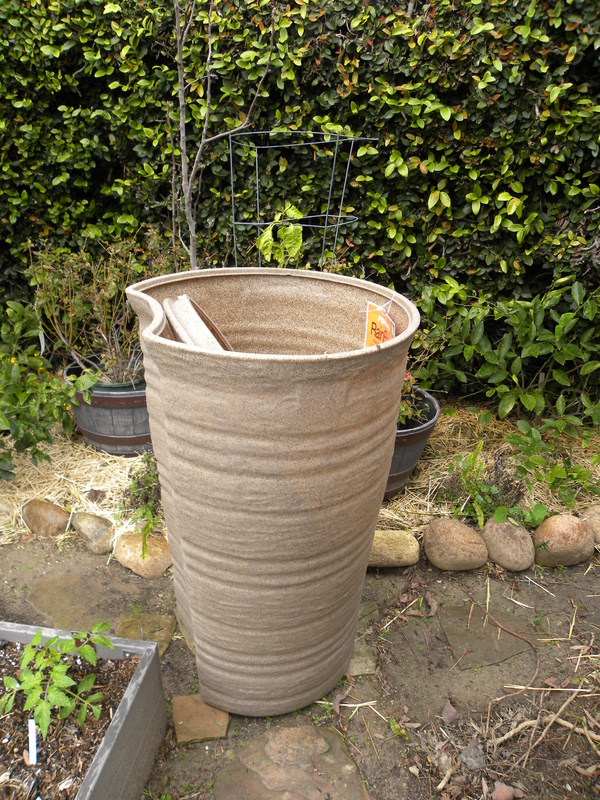 Here an inexpensive 20-gallon Rubbermaid trash barrel holds runoff from our chicken coop roof. Advantage is cost, about $15 for barrel and lid. Disadvantage is no hose. I have to dip the water out with a watering can and keep an eye out for mosquitoes breeding in the water. My first purchase of a rain barrel (but the most recent one to be set up) was a deluxe 50-gallon model that I ordered from Gardener’s Supply Company (www.gardeners.com). At the time I bought it, I could find no rain barrels for sale locally, but that has changed. Gardener’s Supply Company offers four different models. The one I chose is made of polyethylene with a brown finish that looks like textured oak. It features a flat back, a water level indicator, screen on top to keep out debris and mosquitoes, overflow drain, brass spigot and separate hose attachment. It cost $199 plus $20 shipping and handling. 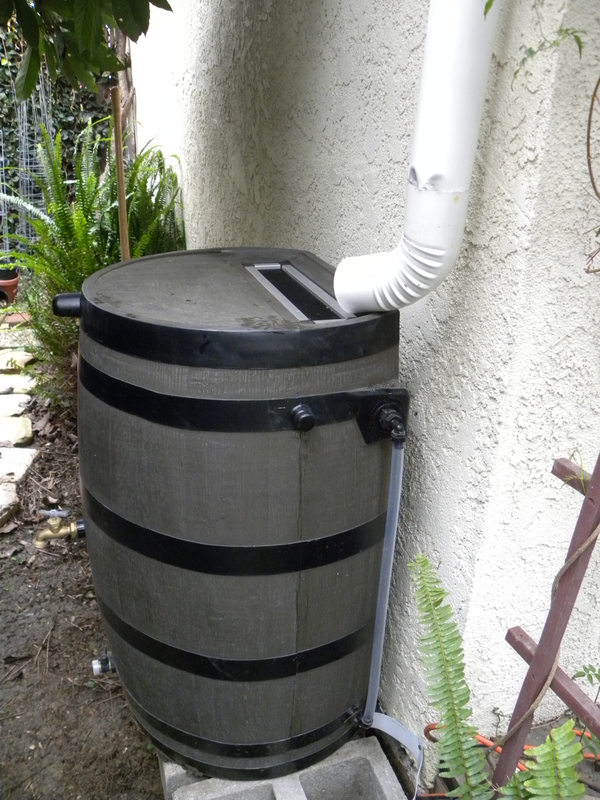 This rain barrel is designed to sit under a drain spout. Prior to buying the rain barrel, we had gutters and a downspout installed on the north side of our house. The gutter guy said that given the amount of roof that was being drained, we’d need about three 50-gallon rain barrels just to capture rain from one storm. But we ran into a snag. The installed downspout went all the way to the ground, but we needed a much shorter one to empty into the rain barrel. We should have installed the rain barrel first, then had the gutter guy cut the downspout to fit. I suppose I could have done it myself with a hacksaw, but I was intimidated by the job. We needed some plumbing work done this week, so I asked the plumber if he could cut the downspout for us. He was only too happy to do so. So in the midst of a downpour, I dug out some ferns that were in the way and got some cinder blocks from Home Depot. My sweet husband leveled the ground and set up the blocks. He detached the downspout from the house. The plumber cut it with his electric hacksaw and crimped the end of the downspout so that it would fit into the curved bottom piece. 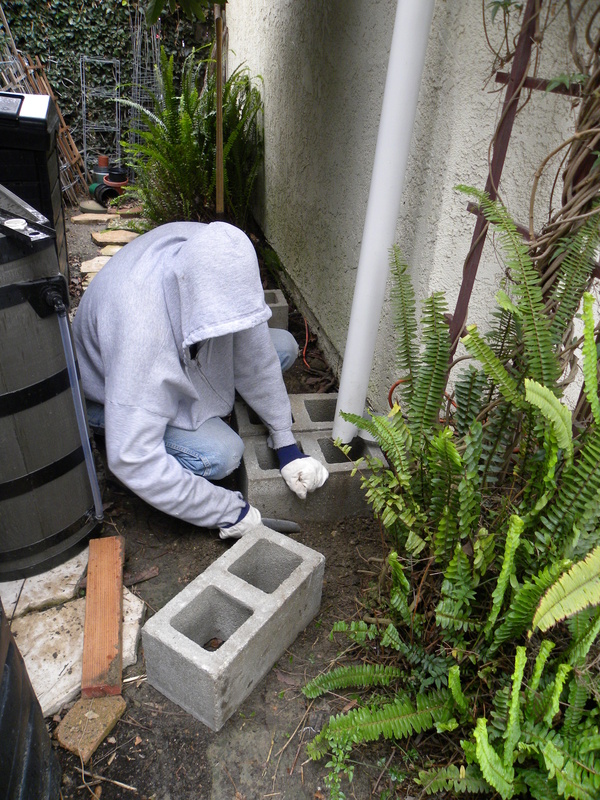 Vic leveled the ground and detached the curved outlet from the downspout. 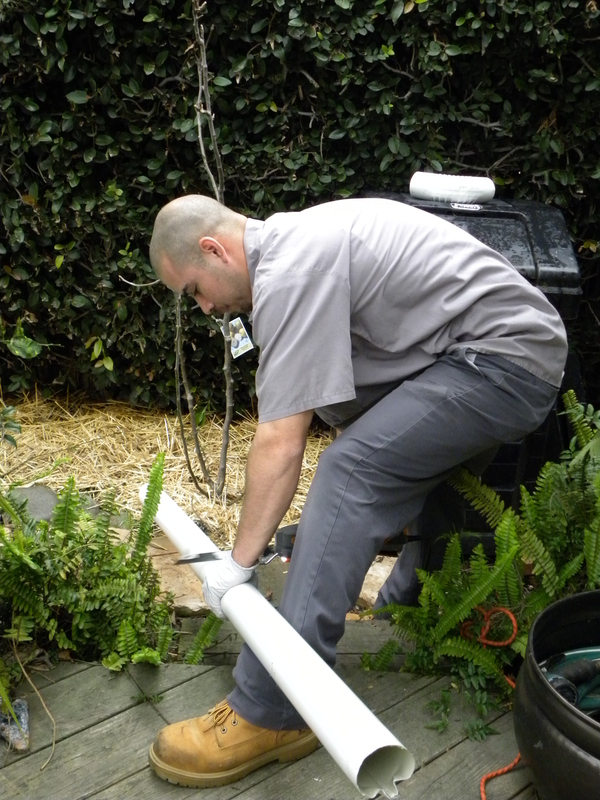 Our plumber, Ray, cut the downspout to the proper length with his electric hacksaw. Installation complete! The rain funnels from the downspout onto the screen on top of the rain barrel. Note the water gauge on the side next to the wall. This is the sound of water being conserved! I was amazed at how fast the barrel filled. In less than three hours of moderate rain fall, the barrel was full. We’re gonna need a bigger barrel! The solution, of course, is to hook up more barrels. This flat-backed, fiberglass (?) rainbarrel from Fiskars has a solid lid, spigot, and a downspout connector for rectangular downspouts. My most recent rain barrel purchase was two rain barrels from Home Depot for $98 each. These barrels are made in the USA by Fiskars and come with downspout connectors and a diverter, plus a spigot. But the connectors were for rectangular downspouts and ours are round. Curses, foiled again. Also, I’m going to need a spade bit for my electric drill to drill the hole for the connector hose. Rats. I just don’t do plumbing. I’m still trying to figure out how to connect these barrels in series with my Gardener’s Supply Company barrel. I use the water between storms to water my vegetable garden and fruit trees, as well as maintain the water level in our front yard pond. I figure that we’ll be able to reduce our tap water usage by about 2,000 gallons a year, or about 20 days worth of water for us. That’s more than a drop in the bucket. This entry was posted in Uncategorized and tagged conservation, drought, Fiskars, Gardener's Supply Company, Home Depot, installation, OSH hardware, photos, Rain barrels, Suncast, video, water, water conservation. Bookmark the permalink. We installed two 55 gal drums this last spring. the sewer and conservation district had a workshop. The kits came with a auto diverter for the down spout. This allows excess water to continue to Mill Creek on its way to the Cuyahoga. Nice post. Thanks, Jim. Good for you for using rain barrels! Our Fiskars rain barrel came with an auto diverter, but the diverter is rectangular and our downspout is round. I’ll get it all set up eventually. Hi, Villager. Rainwater is better for the plants. It’s naturally soft and has no chlorine. Also, it saves energy to use rainwater instead of purified tap water for supplemental garden watering. We have never had any problems with watering garden. There is usually enough rain all year. I water rarely from a well that we have. It is very difficult when you are lacking rain, especially if you have a larger garden. Sometimes mulching helps against too fast evaporation of water in the soil. You’re lucky to have year-round rain, Vrtlaricanna. Good tip about the mulch. I usually forget to mention it. I have mulched around my fruit trees with straw, but have yet to mulch my vegetable garden. One more chore to put on the to-do list. 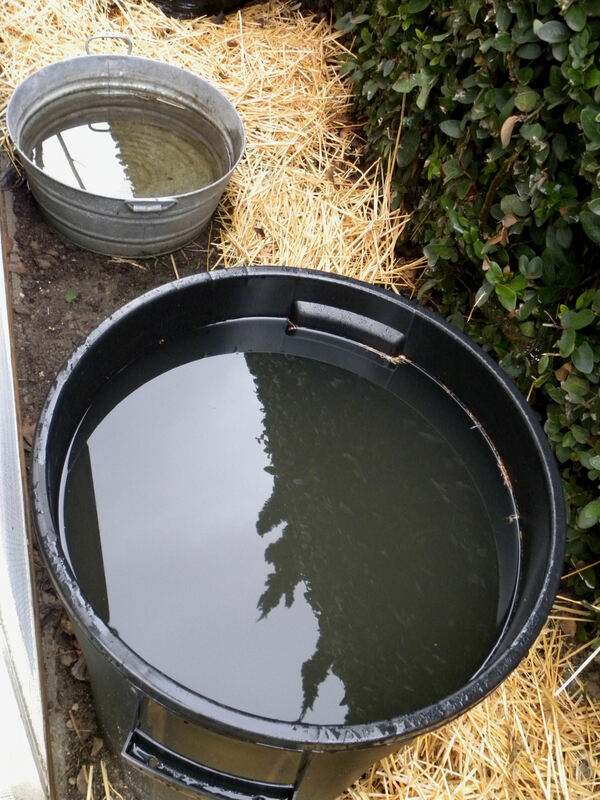 Great post about rain barrels. We are hoping to set some up this year even though we usually get 40+ inches of rain annually. I just can’t bear to waste the water we could get!